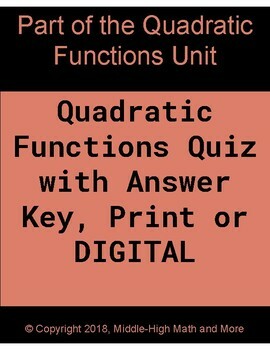 This is a quick one page quiz for students who are just getting started with quadratic functions. 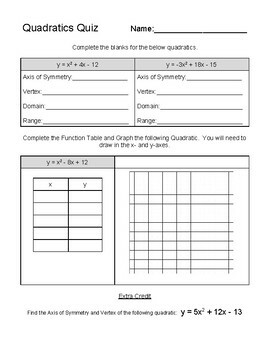 The top of the quiz has two quadratic functions (one positive, one negative) where the student must calculate the Axis of Symmetry, Vertex, Domain, and Range for each. 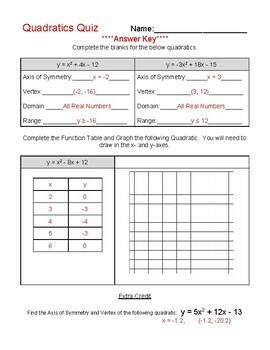 The bottom section has another quadratic function where the student will calculate five points along the parabola (I teach the vertex and two points on each side) to put into a function table. They will then take the points and graph them on the included graph. 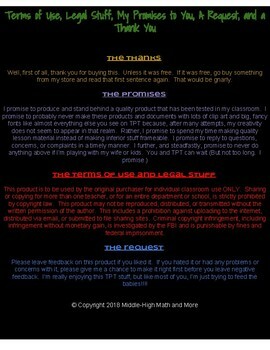 This is not only a print resource, it is also a digital resource that will give you the option of making a Google Docs copy of the entire thing for you to edit and save as you please. Please let me know if you have any questions and I greatly appreciate your business. I think you will find that with most of my products, you get more than your money's worth.